Language Log » A brief history of "taking a knee"
A brief history of "taking a knee"
With dozens of NFL players "taking a knee" during the national anthem as a form of silent protest, the very phrase "take a knee" has been invested with new significance. "Take a knee" or "take the knee" now expresses solidarity against racial injustice and defiance against Donald Trump's attacks on protesting players. As the phrase dominates the headlines, it's worth taking a look at its history in football and beyond. While The Dictionary of American Slang dates the expression back to the 1990s (as noted by John Kelly on his Mashed Radish blog), I've found examples in football going all the way back to 1960. And while "taking a knee" may have also become a military tradition, the phrase's origin is firmly rooted in football, with a number of interlocking uses. "Take a knee," to describe getting down on one knee, seems to be influenced by other "take" idioms, such as "take a seat" and "take a break." But when did the knee-taking begin? Plumbing databases of digitized newspapers, I discovered the following 1960 example in an article about the University of South Carolina Gamecocks. 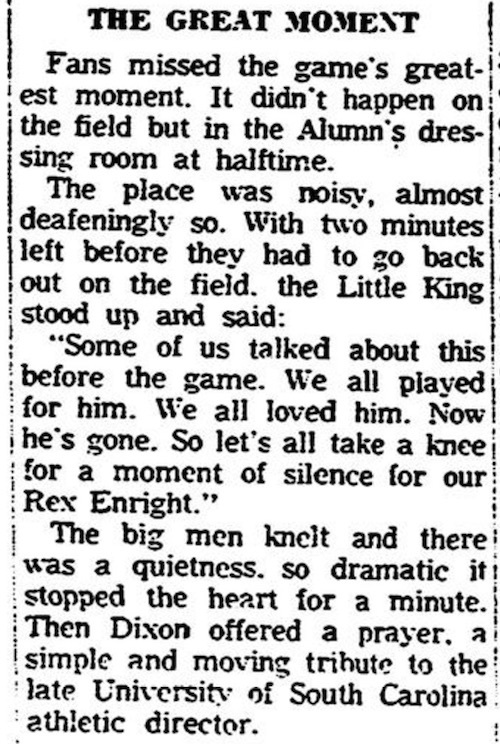 The Gamecocks held a Varsity-Alumni game, and during halftime, one of the Alumni players, Albert "King" Dixon Jr., paid tribute to Rex Enright, a longtime coach and athletic director who had died the month before. With two minutes left before they had to go back out on the field, the Little King stood up and said: "Some of us talked about this before the game. We all played for him. We all loved him. Now he's gone. So let's all take a knee for a moment of silence for our Rex Enright." Knee-taking in this early example takes the form of kneeling in prayer, for a shared moment of silence in the locker room. But when "take a knee" began showing up again in the news databases in the 1970s, it tended to refer to the kind of kneeling one might do when taking a rest or gathering oneself. Levon Berry, a 288-pound tackle for St. Pete, decided to take a knee and adjust the adhesive tape that's wrapped around his street shoes. "We give the team three minutes to get a drink of water or just take a knee," said head coach Al Eure. Bending at the waist is quarterback Jim Reese while line coach Don Smith takes a knee. Wootton Coach Jack Loudenberg had to take a knee until his head stopped spinning after his Patriots' 6-0 overtime victory against host Gaithersburg yesterday in a Montgomery County A League game. The 1974 example is from a caption to a photo showing Abilene Christian University's line coach down on one knee. In the early 1980s, "take a knee" started to appear more frequently for situations in which an entire team would kneel, as for a group prayer, a pep talk from the coach, or a similar moment of solidarity. After the game, which his team won 13-0 for its second straight state championship and its third since 1975, he asked both teams to "take a knee" and he led them and their fans on the field in prayer. The hysterical Eastern Kentucky locker room suddenly became so quiet you could hear a jersey drop as one by one each of the players took a knee and gazed up at coach Roy Kidd. After practice, Robinson meets in the end zone of the defensive team's practice field, orders everyone to take a knee and talks to his team until he's said enough. The underclassmen took a knee and bowed their heads as the departing seniors let their hearts bleed while summing up four years of life in the Ivy League crucible. Pregame or post-game prayer consisted of taking a knee for a moment of silence. Also in the early '80s, "taking a knee" came to refer to various situations on the field where a player ends a play by intentionally kneeling, thus downing the ball. In this 1982 example, the situation in question involves a receiver taking a knee on a kickoff return. Any chances the Illini had for a last-second reprieve were severely dampened when [Kirby] Wilson, apparently thinking he was in the end zone, downed the kickoff that followed [Ohio State placekicker Rich] Spangler's field goal at the Illinois 1. "In that situation he should have let the ball go," said [Illinois coach Mike] White. "We had told whoever got the ball to take a knee (down it), but we said that anticipating a squib kick of some sort. If he had let it go, it would have been brought out to the 20. The clock doesn't start till you cross the plane (of the goal line) with the ball in your hand." Beginning in the '90s, "taking a knee" or "taking the knee" often referred to the "quarterback kneel," where the quarterback on the winning team runs out the clock by kneeling after the snap — either to protect a small lead or as a show of sportsmanship with a larger lead. Allow Colts center Brian Baldinger to reduce Indianapolis' latest dose of disappointment — a 23-17 loss to the Patriots dropped the Colts to 1-13 — to its bitter basics. "It comes down to one nut," he said, refusing to look for a bush to beat around. "We get a first down and we're taking the knee the rest of the game. We get a first down and it's over." Recent history has shown us [Washington Redskins coach Joe] Gibbs is in a no-win situation here. Having run up huge leads against the Lions and Broncos in games the last 15 months, Gibbs had the offense take a knee close to the goal line and was mildly criticized by Wayne Fontes and Dan Reeves, respectively. Supposedly, this was seen as an act of pity and demeaned them. So if you take a knee, you're demeaning the other team, but if you score, you're running it up? The "taking the knee" variant started appearing more frequently as the '90s went on. That's one reason why [Houston Oilers receiver Patrick] Robinson has refused to fair-catch any of the three punts he's fielded, returning them an average of 16.3 yards. Having averaged 31 yards on his two kickoff returns, he was forced to down a pair of kicks deep in the end zone against the Lions, pounding the ball in frustration after taking the knee. "I hate fair-catching. I hate it," he said. "Anyone can catch a ball and kneel down. I want to do something with it." [Houston Oilers defensive back] Marcus Robertson's first of his career-high three interceptions came when he was 7 yards deep in the end zone. Instead of taking the knee, he ran it out and rumbled 69 yards before Tommy Vardell chased him down at the Browns' 38. And not everybody is going to go for the end zone in the final seconds of a game already won. But Calgary did, when it sent [Calgary Stampeders running back] Tony Stewart around end for a 5-yard touchdown on the last play of regulation, padding a 35-16 lead. [Baltimore Stallions coach Don] Matthews declined to complain, but it did not go unnoticed by the players. "I asked Jim Popp (the team's personnel director), 'Is this how this league is?'" said wide receiver Walter Wilson. "What happened to taking the knee?" At the end of the fizzled rout, with the ball inside the Miami Dolphins' 10-yard line, the Dallas Cowboys had one more chance to stick it to former coach Jimmy Johnson. There was little debate on the Dallas sideline. Take the knee on the final three snaps, and leave Pro Player Stadium with a 29-10 victory. Since Colin Kaepernick began kneeling during the national anthem last year, the expression has taken on a very different set of associations, now appearing in hashtagged form as either #TakeAKnee or #TakeTheKnee. As John Kelly observes, "take a knee" has outnumbered "take the knee" in search frequency as measured by Google Trends. But as a generalized slogan for a movement expanding well beyond the gridiron, "take the knee" may find greater success. Hmmm … can you please also analyze THIS linguistic weirdity in the news? According to an interview I've just seen with Kaepernick, he got the suggestion from a Vietnam vet. Taking a knee was a way to honour a comrade who'd been killed; as per the 'military tradition' Ben links to. Kaepernick had previously been using a less demonstrative protest. Does that mean he was unaware of its longer-standing origins in NFL? AntC: John Kelly provides the military background for Kaepernick's gesture on his Mashed Radish blog. Though sitting itself has a long history in the Civil Rights protests, Kaepernick, joined by teammate Eric Reid, made a different gesture in his final preseason game: They took a knee, i.e., knelt down on one knee. Before the game, Kaepernick and Reid spoke with Nate Boyer, a former long snapper and Green Beret, who had previously written him a letter expressing a frustrated understanding of his protest. During their conversation, Boyer encouraged Kaepernick to “take a knee” as a compromise, in part honoring men and women who have sacrificed themselves for what the anthem and flag represent and in part peacefully protesting injustices that have failed to live up to that symbolism. The gesture of taking a knee is a dynamic and complex one, and one that many soldiers, like Boyer, indeed do to show respect for their fallen fellows or to take a rest while on a mission. I highly doubt Kaepernick was unfamiliar with football's own knee-taking traditions, but learning of its respectful military use evidently gave the gesture extra significance for him. Anxiously awaiting a bgz history of the word "brief". google's "ngram" shows "take a knee" and "taking a knee" in the 1800's. Flemur: Even just looking at usage in football reporting appearing in the newspaper databases, the majority of hits for "take a knee" are false positives — such as when a player "takes a knee" to the head/ribs/groin, etc. (i.e., receives a blow in a collision with another player's knee). As always, context is key. My last year of organized football was middle school in 1978 in Iowa. Not sure if we used "take a knee" then, but I definitely associate it with football practice. When the coach yells "All right everybody take a knee" it means, "take a break (on one knee) and listen to me". Not to be confused with taking an arrow to the knee. I would have thought that "to take a knee", especially for something of principal, might be word play related to "to take a stand". Thanks, I'd guessed that the original meaning was downing the ball, so I had it backwards. The 'downing the ball' sense could have been developed independently, it seems to me, but I guess it wasn't given the idiom already existed among football players (if not known to the fans). Now perhaps here's a more interesting point: the use of the singular in the phrase implies only one knee resting on the ground – a position certainly less natural than putting down both knees. Is that the way such a phrase would be invented in contradiction to the common 'kneel'? Also of interest would be comparing with "on bended knee" which is a very old phrase and represents an identical physical position and, in some cases, similar symbolic meaning. A cursory search turns up a great deal of food for thought. While the meaning would have morphed to today's Kaepernick usage, perhaps one might consider boxing: ca. 1865 Marquess of Queensberry Rule 10: "A man on one knee is considered down and if struck is entitled to the stakes." Typically today, a boxer whose knee touches the ground, whether intentionally or unintentionally, has to take a mandatory 8 count from the referee, and is deducted one point from that round's score. So, before Kaepernick and other anti-police-violence protesters' quite different meaning, "taking a knee" is a boxer's way of taking a needed breather at the cost of probably losing that round. Anyway you slice it, taking a knee is a time for quiet contemplation, and a show of respect. I've been wondering why whenever we discuss those who have fought for our flag we only refer to the military. What about all those who lost their lives in the Civil Rights Movement? All those who came before us who have marched in our own country to protect everyone's rights? Why don't we hear reference to Selma, Martin Luther King, Rosa Parks? I would bet that this is probably the first time for the majority of the NFL players, that the national anthem actually had some meaning for them – where they were actually thinking about what it means to them personally and what it means to others. Maybe interesting, the latest Game of Thrones season had many references to "bending the knee", i.e. swearing fealty to a king or queen. Apparently, no one here recalls a more recent example of "taking a knee," but one which predates Kaepernick. Of course, Tim Tebow got down on one knee not to protest, but to praise God…for which he was mocked by the same people who now see Kaepernick as some sort of hero.